Hisense wants to take out the budget TV market - but does its new 4K TV deliver? The Hisense R7 series offers one of the best budget TV options ever, and while in some situations you may prefer to go for the TCL S405 series, for most the Hisense R7 is the way to go. The budget TV market is seriously heating up. With options like the TCL 4-series, including the TCL 55S405, TV shoppers who don’t want to spend an arm and a leg are spoiled for choice. Of course, TCL isn’t the only option for those people - companies like Hisense are also making excellent inexpensive TVs. Like, for example, the Hisense R7 series. The R7-series, comprised of 43-inch, 50-inch, 55-inch and 65-inch models (called the 43R7E, 50R7E, 55R7E, 55R7E and 65R7E, respectively), delivers a 4K resolution and HDR through the HDR10 standard at a very decent price. But with so much competition in this price range, Hisense has an uphill battle ahead of it. Is its 50-inch value screen worth the cash? We put the 50-inch HiSense R7 to the test to find out. As mentioned, there are four different models in the Hisense R7 series, but they all feature a very similar design, at slightly different prices. You can apply the majority of what is said here to any of the four models in the series. The overall design of the TV is really nothing to write home about. It features decently-sized bezels around the display, along with a Hisense logo on the bottom, in the middle - right where you would expect it. Safe to say, Hisense has put functionality over beauty here, but that’s not necessarily a bad thing. One of the middle children of the series, Hisense 50R7E is a little over three inches deep, which is fine, but not groundbreaking. It would have been nice to see the TV slim down a little, and we hope that Hisense does so in future iterations. That said, it’s a little hard to complain given the price tag of this TV. On the back is where most of the action happens, of course. On the right, you’ll get a simple power port and on the left you’ll get all the connectivity you need. That includes a USB port, component ports, three HDMi ports, an optical output, headphone jack, and ethernet port. There’s also the remote to consider, but given the TV supports Roku, it’s very similar to many of the other Roku TVs out there. You’ll find a directional pad, home and back buttons, volume controls, quick access to Netflix, Hulu, Sling TV and PlayStation Vue, and some other playback controls. It’s really pretty easy to use - though certainly nothing special in terms of functionality. Perhaps the biggest thing missing is a microphone for voice searches. Physically setting up the TV is really pretty easy. You get two V-shaped legs with rubber padding to prevent any slipping, and they screw easily into the TV using two screws each. Design TL;DR: The Hisense R7 doesn’t look bad by any means, but it’s very generic. If you’re looking for a super stylish TV, this may not be the one for you. Like plenty of other TVs these days, the Hisense R7 series comes pre-loaded with a smart TV platform. In this case, it’s Roku TV - which has been hailed by many as one of the better platforms out there as it’s easy to use, highly functional, and simply works great. Perhaps one of the best things about Roku is that these days it offers pretty much any content app you would want. Whether you prefer to watch through YouTube, Netflix, or Amazon, Roku pretty much has you covered. The Roku TV app is also pretty helpful. Through it, you’ll be able to do things like curate content and tell Roku to alert you when new TV shows and movies are available - which can get very handy for those that always have a long list of things to watch. Perhaps the only real downside to Roku is that it’s not the smartest platform around. The service could use artificial intelligence and built-in voice controls - while you can voice search with Roku, you can only do so through the app. Smart TV TL;DR: Roku constantly rates as one of the better smart TV platforms out there, and while it could get smarter, the huge range of compatibility should be helpful for most. The Hisense R7 offers pretty decent HD video quality, though we recommend playing around with the different picture settings. There are a few options to choose from, and in our experience they’re definitely not all created equal. When viewing SDR content, you’ll get generally accurate and deep colors for a TV in this price range, and while the dynamic range in SDR mode does leave a little to be desired, some of that can be rectified based on the picture mode you choose. There are quite a few different picture modes here, including Movie, Normal, Sports, Vivid, Low Power. Unfortunately, we found that the picture modes were a little hit and miss. Movie, for example, resulted in yellow-tinted whites, while Vivid seemed a little harsh. Thankfully, you can go in and tweak the different color modes to your liking, though that may require some time if you’re new to that kind of thing. Black levels are generally pretty good, though of course not quite as good as you would get on an OLED panel or even on a more expensive LED display. Upscaled HD content looked pretty good, but again, not quite as good as a more expensive panel. It doesn’t seem as though Hisense necessarily adds more detail to HD content, so if you’re looking for added detail you may be able to get that from your source. HD/SDR Performance TL;DR: With HD/SDR content, the TV performed very well, offering excellent color reproduction and a range of picture modes. Upscaling wasn’t the best on the market, but the TV still looked generally very crisp. 4K HDR content is where this TV really steps things up, especially for a TV in its price range. The Hisense R7 boasts HDR10 support, and we found that with HDR content, the TV looked far better than most others in its category. When the source is 4K, the TV boasted an excellent image clarity with plenty of detail. Streams from Netflix looked beautifully sharp, so assuming you have access to 4K content, you’ll enjoy crisp detail. We found that the TV was best enjoyed head-on, but only some dynamic range was lost at different viewing angles. With HDR content, you’ll have three different picture modes - Dark, Normal, and Bright. We found that Normal or Bright offered the best picture, while Dark seemed to give an overly pronounced yellow tint. The TV looked excellent with HDR video games. Playing Star Wars: Battlefront, we found that colors were bright and vivid, making for a much more immersive gaming experience. 4K/HDR Performance TL;DR: HDR content is where this TV really shines - colors were deep and vivid, while gaming in HDR mode on the TV resulted in a very immersive experience. The Hisense R7 is aimed not only at offering a great visual experience, but also a good audio experience. While the speakers on the TV won’t compare to a dedicated soundbar or speaker system, for built-in speakers, it sounded pretty good. The bass was perhaps the weakest aspect of the TV’s built-in speakers. While listening to music, kick drums and bass guitars just didn’t shine through the way they should have, while explosions and car engines lost some depth while watching movies and playing games. Still, the mid range stepped things up a little. The low-mids seemed to offer a decent amount of warmth, while the high mids offered plenty of room for a lead vocal or for dialog in a TV show. The high-end seemed to suffer from similar issues as the low-end, but to a lesser extent. That’s to say, while what was there sounded fine, it definitely could have used a little more extension. Frequency response aside, this TV can get pretty darn loud. We don’t think most users will ever need to get past half as loud as the TV could get -- and most of the time we hovered around the 25 percent range. But all that is from the perspective of a self-proclaimed audiophile. Generally speaking, the speakers in the Hisense R7 are quite a bit better than what you’d find on other TVs in this price range, so if your budget is a little limited you won’t have to worry about seriously under-par audio. The Hisense 50R7E isn’t just an excellent choice in its price range - we think it could go head-to-head with plenty of more expensive offerings. Sure, it’s not perfect - audio quality is pretty good but a little lacking in the low-end, and while deep, blacks simply aren’t as deep as what you would get from a more expensive TV. Having said that, however, for the price this may well be one of the best TVs on the market. There is some competition. Perhaps the biggest competition comes from the TCL S405 series of TVs. TCL’s TVs offer slightly larger sets for lower prices, but if you can afford it and value things like color reproduction over TV size, then we still think the Hisense R7 series is the way to go. 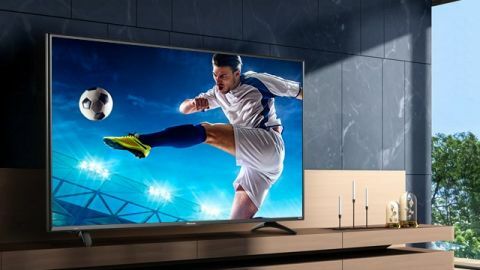 If you’d simply prefer a bigger TV that still offers 4K HDR support and decent color reproduction, however, then the TCL S405 may be what you're looking for.